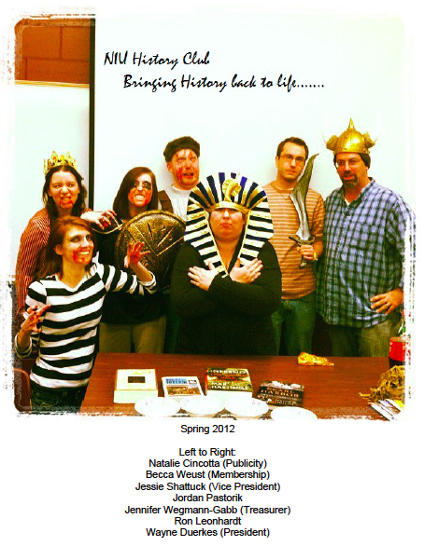 The NIU History Club is for all members of the NIU community with an interest in history. It was designed to be an avenue for history undergraduate students to create academic and professional relationships with faculty and other history students within the Northern Illinois University Department of History. We invite you to attend our weekly meetings where we promote activism through historical knowledge, host trivia nights, movie nights, informational presentations from other campus resources (such as Career Services, the CLAS Internship Coordinator, the Study Abroad Office, OSEEL, etc.) and occasional field trips to local museums and historical sites. It is our mission to promote and expand the knowledge of History within its members and the community of Northern Illinois University. Members as tomorrow's leaders may utilize this opportunity to develop and improve their leadership skills for the betterment of the future, for both themselves as well as for society, while learning from the past. The label for the object chosen by the 2014 History Club. 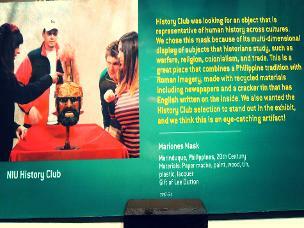 The object is currently on display at The Anthropology Museum at NIU in Cole Hall. The History Club meets Thursday nights at 6 PM in DuSable Hall 248. For the most up-to-date information and scheduled events, follow the NIU History Club Facebook group. This website was last updated February, 2015. The best way to stay updated with the History Club is to follow our Facebook group, "NIU History Club." Follow us on Twitter: @NIUHistoryClub.